Sunshine Coast developer Henzell Construction has announced the launch of a $15 million exclusive residential sanctuary overlooking the Pelican Waters soon-to-be-built marina and town centre on the southern Sunshine Coast. 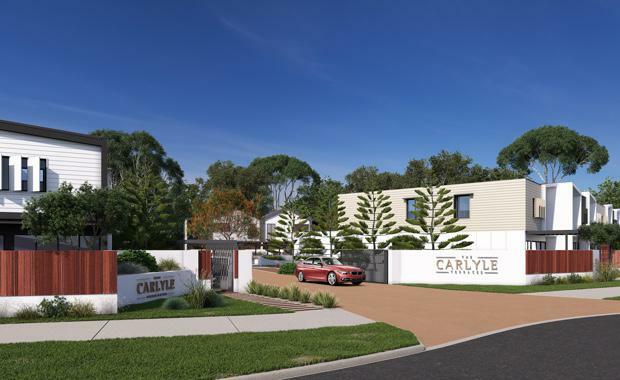 The Carlyle Terraces, will feature a collection of 25 three bedroom, double storey, low-maintenance luxury terrace homes ranging in size from 200sqm to 254sqm. Mclean Henzell of Henzell Construction said Carlyle Terraces was the first terrace home project for the masterplanned Pelican Waters community, offering buyers a unique blend of luxury and a low maintenance lifestyle within walking distance of world class facilities and attractions. Priced from $540,000 to $660,000, he said the terrace homes would appeal to retirees, downsizers, professionals and small families. Project Sales Consultant for the development, Rhonda Carter, said sense of space, attention to detail and prime location would drive high interest in The Carlyle Terraces. “In addition to the emerging town centre and marina plus upcoming childcare centre and health hub on the doorstep, the existing nearby shopping centre, waterfront tavern and bus stop highlight the premium location of this new development,’’ Ms Carter said. Other nearby features including Pelican Waters Golf Course, bowls club, local supermarkets, Caloundra CBD, patrolled beaches, numerous parks and waterways, health services, a range of primary and secondary schools and easy access to the Bruce Highway for an easy commute to Brisbane ensure its standing as one of Queensland’s most desirable places to live, work and play. “Once people move in, they will never have to move again,’’ Ms Carter said. Designed to the highest standards, The Carlyle Terraces features 21 superbly-crafted three-bedroom, 2.5 bathroom terrace homes and four villas, built to optimise the coastal lifestyle. Sense of space is a key feature with these striking two-storey properties offering magnificent master bedrooms upstairs or down providing complete privacy with luxurious ensuites and walk in robes. “The generous free-flowing interiors are complemented by the highest quality fixtures and fittings including ducted air conditioning and modern appliances. “Stone benchtops executive kitchens complete with butler’s pantries; dedicated laundry areas; study nooks and dual living areas further enhance the appeal,’’ she said. The Carlyle Terraces is presently being sold off the plan, with construction expected to be completed by 2017. The Pelican Waters masterplanned community has been under development for nearly 30 years and offers a variety of product including home sites, new homes, apartments and villas spread across more than 800 hectares. The Pelican Waters residential community has sold more than 2000 home sites, since first released to the market in 1989. When fully developed the suburb of Pelican Waters will have a population of approximately 12,000 residents and it has been gazetted as a suburb of Caloundra by the Queensland Government. Pelican Waters covers an area of 4km by 2.5km with 42% of its total area as open space. Pelican Waters is one of Queensland’s leading integrated communities. With its proximity to the open waters of Pumicestone Passage and the Caloundra CBD, Pelican Waters is fortunate in being one of the most strategically located master planned communities on the Sunshine Coast. Just one hour north of Brisbane and the international airport and just 30 minutes to the Sunshine Coast Airport, the community is minutes from some of the world's best beaches. Craggy headlands, offshore reefs, pounding surf, secluded bays and protected waterways provide a never-ending variety of playgrounds for water lovers.